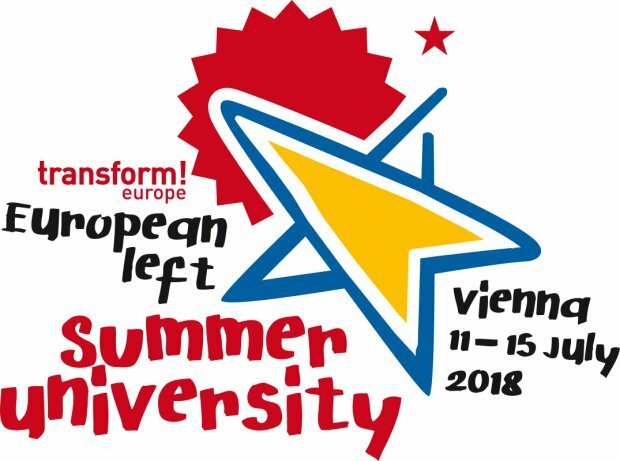 280 participants from 35 countries gathered in Vienna at the wonderful Young Workers centre at the edge of the city in July to celebrate the Summer University of the European Left, reports Joseph Healy. Those gathered there did not only represent member parties of the European Left but many academics, thinkers, and members of various social movements across the continent. At the same time as the main university, there was a youth event with many young activists from across Europe having their own workshops, outings and social events. The event began on the Wednesday evening with a memorial for an Austrian communist who had been active in France and had died a couple of years ago. Several of her comrades spoke of her dedication to socialism, feminism and free thought and the Aaron Quartet from Vienna played music by Hans Eisler, the great communist composer along with music specially composed for the occasion, with the composer rising to take the applause! On the Thursday morning, Gregor Gysi the President of the European Left and Michaila from Vienna University spoke about Marxism and Feminism respectively. Gysi spoke of the historical development of Marxist thought and of the various differences along the way ranging from Lenin to Lukacs and Gramsci. He finished by stating that the unveiling of the Marx statue in Trier for the bicentenary had been a highlight for him and that he had caused consternation at Trier University when he suggested in an address that the university should be renamed the Marx University in honour of one of the greatest thinkers in world history. There were many seminars on Thursday, Friday and Saturday ranging from alternative energy to the Mediterranean zone and its politics. I attended a seminar on war and NATO where Claudia Haydt the Die Linke MP warned of the current plans by the EU to form a new European army and defence strategy. She warned that Europe was stumbling towards a situation similar to that which had led to the outbreak of World War 1. A member of the audience from Transform Europe recounted how a Russian academic had told him recently that meetings of the Russian Academy of Science and Defence were now openly speaking of the real prospect of war with the West! The seminar I spoke at on the Rise of the Far Right in Europe was the best attended of the Summer University and there was a real sense of fear at the event about the rise of Fascism in Europe and a determination to counter it. I spoke about the historic rise of Fascism and the resonance with today, quoting from Neil Faulkner’s book “Creeping Fascism”. A Polish academic showed a chilling video of Fascist mobs rampaging through central Warsaw with burning torches and carrying banners saying “We need God!”. Culture was not neglected at the Summer University with legendary radical theatre director Eva Brenner staging a short scene from Brecht’s play “Conversations with Refugees” set among refugees from Fascism in Finland in 1940 – a play with echoes from our present. We also had a walking tour of “Red Vienna” looking at the radical history of the city between the wars and the resistance to Nazism. A fascinating and exhilarating exchange of ideas between radicals and Left thinkers from across Europe! I will definitely be going back again!